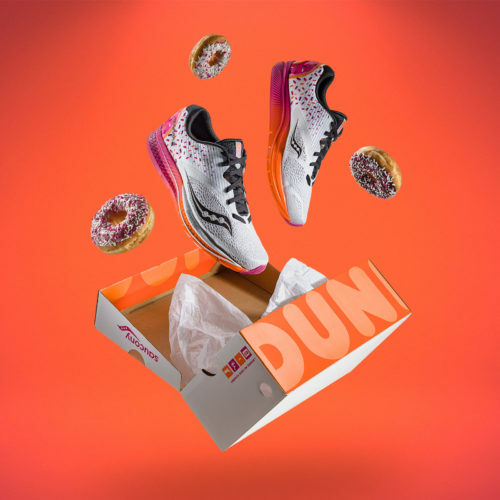 Whether you’re running the Boston Marathon or cheering participants on, Saucony and Dunkin’ Donuts have dreamed up a shoe to keep you going until the finish line. 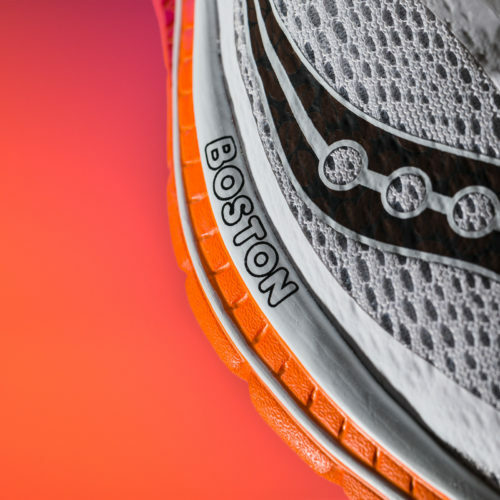 Each year, Saucony designs a special shoe for the Boston Marathon. This year’s inspiration came directly from catering. Before the Dunkin’ coffee provided for the meeting got cold, the idea was born. The design started with popular Kinvara 9 shoe, a lightweight running sneaker and Saucony bestseller. A color scheme of white, magenta, and orange matches the donut shop’s decor. 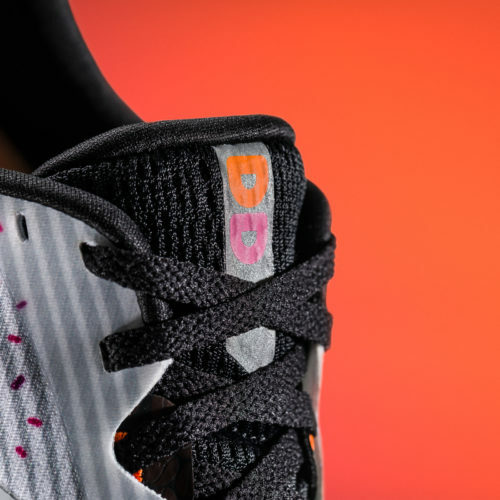 Details include sprinkle and coffee bean imagery, and insoles inspired by iced and hot coffee. 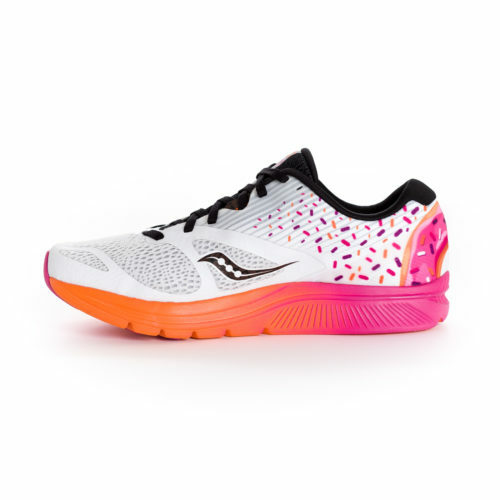 Three sets of laces in black, magenta, and orange are included, and the shoe is cushioned with Saucony’s EVERUN sole technology for maximum comfort and bounce. The packaging will get your coworkers’ hopes up with a box that doesn’t contain a dozen donuts. This isn’t Saucony’s first food-inspired offering, either. A few years ago, the shoe company rolled out a pair of pumpkin spice latte sneakers, because of course they did. The kicks are available in men’s sizes 7-13, 14, and 15 and women’s sizes 5-12. They retail for $110. Pre-orders start today, March 27th on Saucony’s website. If you’ll be in the Boston area, you can purchase the shoes at Marathon Sports stores starting on April 3rd and at the John Hancock Sports & Fitness Expo starting April 13th. Saucony dropped a teaser video in anticipation of the launch. Waiting at the finish line. Motivate the runner behind you with these scrumptious shoes. 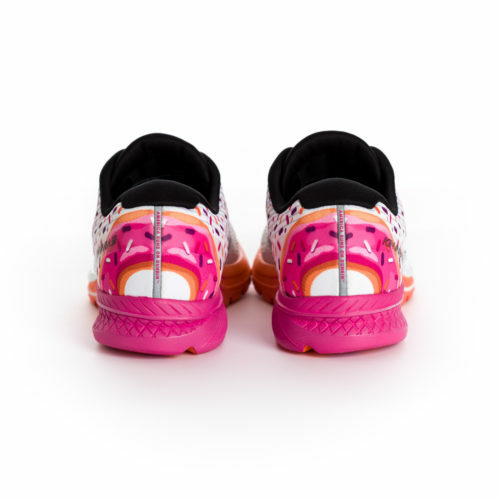 You can pre-order the Saucony x Dunkin’ Kinvara 9 ($110) on Saucony.com. You can also purchase these delicous-looking shoes at Marathon Sports stores starting April 3rd and at the John Hancock Sports & Fitness Expo starting April 13th, while supplies last. Hit up Dunkin’ locations for your donut and coffee fix any time.